HOURS M-F 8 a.m. – 4:30 p.m. HOURS M-TH 8 a.m. – 9 p.m. F 8 a.m. – 5 p.m. SA 8 a.m. – 4 p.m. SU 1 p.m. – 5 p.m.
City offices will close in observation of holidays on Monday, May 27, Thursday, July 4, and Friday, July 5. In each case, offices will reopen at 8 a.m. the following weekday. Closing information the Irene MERRIAM HIGHLIGHTS & RECREATION for // SUMMER 2019 B. French Community Center is on page 18. The City is offering large-item pickup for residents to dispose of items such as furniture, appliances, carpets, and rugs. Please place items by your curb before 7 a.m. on your scheduled pickup day. Yard of the Month Summer is near, which means it’s time to beautify your yard with colorful flowers, pruned trees, and shrubs! Showcase your gorgeous property and have a chance to be recognized as the City’s “Yard of the Month.” City staff will identify wellmaintained properties each month from May through September. Find more information at merriam.org/largeitem. Winners are announced each month in e-Merriam, the City’s electronic newsletter. Visit merriam.org and click “Notify Me” to sign up for e-Merriam. Ward One Councilmember Weems Resigns The City Council formally accepted Ward One Councilmember Robert Weem’s resignation on Feb. 25. Elected in April 2015, Weems cited a move out of the city limits as the reason for resigning. The City Council is reviewing applications for filling his vacant seat. A new councilmember should be onboard in mid-April. 5701 Merriam Drive Steering Committee In 2020, the Parks and Recreation Department will leave the existing Irene B. French Community Center (IBFCC) and move operations into the new community center at Vavra Park. What occurs next at 5701 Merriam Drive is a topic of great interest throughout the community. Last September, nearly two dozen residents applied for the steering committee to explore possible options. In October, Mayor Ken Sissom and the City Council appointed nine Merriam residents to serve on the committee. They represent a diverse group of professional backgrounds and are distributed geographically and across the age spectrum. The committee members will make a formal recommendation to the City Council for a preferred option and funding strategy. Committee meetings are held at the IBFCC and are open to the public. There also will be at least two larger public meetings to roll out work progress and seek feedback. Visit merriam.org/5701 for additional information on meetings, meeting packets, minutes, and presentations. The City of Merriam is ready to dive deep into its growth and development with a new comprehensive plan. It’s the document city leaders use to provide direction on Merriam’s future development. Since 1968, Merriam has had four comprehensive plans. The most recent plan was adopted in 2001, which guided a number of residential and retail redevelopments, including Timber Ridge, IKEA, Hobby Lobby, and several car dealerships. Public participation is crucial to the plan as it needs to reflect residents’ vision for Merriam’s future. The City will reach out to you in a number of ways over the next two years. You also can stay updated on the process and how you can participate by visiting merriam.org/compplanupdate. Donations help offset event costs and will go to the Merriam Parks, Recreation, and Community Center Foundation and the Shawnee Mayor's Christmas Tree Fund. **The line into the recycling event will be cut off at 11 a.m. All vehicles in the parking lot at 11 a.m. will have their items collected. ** Thanks to our partners: City of Shawnee, PROSHRED, Merriam-Shawnee Lions Club, and Johnson County Household Hazardous Waste. Merriam Non-Discrimination Ordinance Now In Effect The City’s recently approved non-discrimination ordinance took effect on Jan. 22. The ordinance prohibits discrimination in the City of Merriam in employment, housing, and public accommodations on the basis of an individual’s sexual orientation or gender identity. Any person within city limits who has four or more employees, who sells real estate or rents housing with more than four units, or who offers goods, services, facilities, or accommodations to the public must comply with this ordinance. However, religious organizations and nonprofit fraternal or social associations are exempt from parts of the ordinance. Anyone who believes they've been discriminated against under this ordinance may complete a complaint form and submit it to the City. Additional details about the ordinance and enforcement process are available at merriam.org/NDO. Building Permit Map Now Available Online Building is booming in Merriam, and now you can track it in real time. The Community Development Department in January launched a new map on the City’s website that identifies open building permits throughout the community. The map, which will be updated monthly, provides pin locations for every building permit issued. The pins contain additional information about the building permit, including the type of permit, permit number, and issue date. Find the map at merriam.org/maps. Merriam Welcomes New Fire Captain Newly promoted Overland Park Fire Capt. Chris Palmer now leads the team in Merriam. Capt. Palmer is a 19-year veteran of the Overland Park Fire Department. He’ll serve as one of three captains at the Merriam fire station. Capt. Palmer filled a vacancy created by Capt. Doug Crockett, who served Merriam for 32 years until he retired this past December. After 32 years of service with the Merriam Police Department, Chief of Police Michael Daniels retired on April 1. Chief Daniels began his tenure as a patrol officer in 1987 before rising up the ranks to chief of police in 2014. Chief Daniels said he’s grateful for the opportunity to serve Merriam’s residents and businesses throughout the years. Chief Daniels oversaw the police department’s remodeled facility last year and brought back the police bicycle unit. He also was committed to having officers attend every City event and connect with students at Merriam Park and Crestview elementary schools. “He brought many improvements to the Merriam Police Department during his tenure,” Mayor Ken Sissom said. “He will be greatly missed, and I wish him all the best in the future.” Chief Daniels started his career with the Merriam Police Department after graduating from the University of Central Missouri with a bachelor’s degree in the administration of justice. Read more about Chief Daniels’ retirement at merriam.org. Captain Todd Allen Named Acting Police Chief Capt. Todd Allen took over as Merriam’s acting chief of police on March 26. Acting Chief Allen began his career with the Merriam Police Department in 1996 after graduating from the Johnson County Regional Police Academy. He rose the ranks over the past 23 years, serving as a captain for the previous five years before being named as the acting police chief. “I look forward to continuing to serve the City of Merriam and its citizens in this new role,” acting Chief Allen said. Two Police Officers Battling Cancer In January, two Merriam police officers were diagnosed with cancer. Maj. Darren McLaughlin, a 29-year veteran, is battling lymphoma and Cpl. Philip Lewis, a 17-year officer, is fighting colon cancer. Both officers were released from the hospital in February and are fighting their battles at home. It will be a very long road to recovery. Please keep them, their families, and our police family in your thoughts. Donations for both officers are being accepted at any of the six local Public Safety Credit Union branches.The accounts are set up by Answering the Call under each officer’s name. You can also mail donations to “Answering the Call” at P.O. Box 6763; Lee’s Summit, MO 64064; or drop off at the Merriam Police Department. In addition to her duties as a patrol officer, MPO Jasinski holds a number of special assignments within the department. She’s a field training officer, instructing newly hired officers. She’s also a tactical medic instructor, an active shooter response instructor, and a member of the department’s peer support team. MPO Jasinski has previously served as a member of the U.S. Army Reserve and is on the Merriam police honor guard. In 2018, MPO Jasinski was recognized for saving two lives; one involving a man having a heart attack and the other involving a choking toddler. Congratulations, MPO Jasinski! Records Clerk Retires Merriam Police Department Records Clerk Karen Gibson retired on March 25 after nearly 30 years with the City of Merriam. Gibson started her career with the City in April 1990 as a part-time facility supervisor at the community center. She joined the police department two years later, providing a variety of administrative duties. Gibson worked for four different police chiefs during her career. “With a small department, you become a close-knit family, and that's what I truly loved about working for this department,” Gibson said. Gibson will now trade maintaining police records for traveling and running after her 10 grandchildren. Merriam Police Officer Receives Life Saving Award Officer April Gebke was honored with a Life Saving Award on Jan. 14. Last December, Officer Gebke responded to a car crash where the driver had suffered cardiac arrest. Officer Gebke quickly removed the driver from the vehicle, began chest compressions, and then hooked up an AED to administer several shocks to the driver. The driver made a full recovery. “We are very proud of Officer Gebke and the work she did to save a life in Merriam. Her quick response and action to start life-saving efforts were crucial to helping the driver survive what otherwise might have been a fatal event,” Merriam Police Chief Michael Daniels said. Merriam Welcomes Two New Police Officers Police Officers Nick Moeller and Kaleb Bryant were sworn in on Jan. 14. Officer Moeller said he knew he wanted to be a police officer since he was a young child. Originally from Davenport, Iowa, Officer Moeller holds a bachelor’s degree in criminal justice and sociology from Simpson College. Officer Bryant comes to the City of Merriam from the City of Overland Park, where he also grew up. He's currently attending Johnson County Community College pursuing a criminal justice degree. Crashes Down on Shawnee Mission Parkway Statistics collected for the 2018 Merriam Police Annual Report showed the fewest number of crashes on Shawnee Mission Parkway since 2013. There were 116 car crashes in 2018, down from its peak of 167 crashes in 2014. In March 2017, the police department began using Data-Driven Approaches to Crime and Traffic Study (DDACTS) enforcement to find areas with high incidences of crime, car crashes, and traffic violations. Merriam police identified Shawnee Mission Parkway as a primary focus of traffic enforcement and said the crash reduction is due, in part, to the program using statistics to determine the most effective places and times to patrol areas in Merriam. 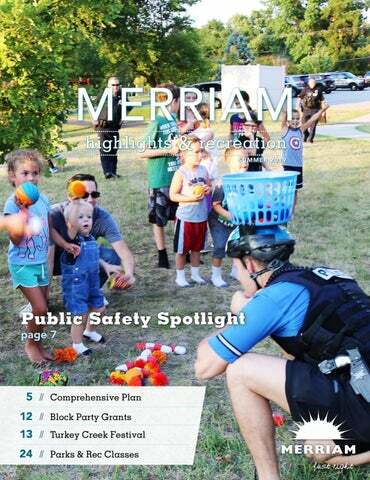 Read the 2018 Merriam Police Annual Report at merriam.org/police. Visitors Bureau Launching New Activities The Merriam Visitors Bureau is off to a busy start in 2019, and we’ve got a great, summer activity lineup for our community. If you’re entertaining out-of-towners, bring them in to say "hello!" Starting May 1, you can have fun seeking sunshines across Merriam with the Sunshine Scavenger Hunt. If history is more to your liking, stay tuned for details on how you can take Merriam’s Interactive History Tour launching this summer! Perhaps a laid-back itinerary is on your summer radar – if so, stop by the Visitors Bureau (6304 E. Frontage Road) for a guide, map, postcard, local referral, or an icecold beverage. Got guests this summer? Pick up your copy of our Visitor Guide at any City building or view it at exploremerriam.com. Thanks for sharing the community you love with those who visit—we appreciate your hospitality! you need, but when you have team members who truly care about each individual guest, it makes their experience memorable and unique. This is what we do at Drury. We want to give memories. We want them to have an exceptional stay and remember our friendly team in Merriam! If you were to walk in our hotel, you would get a smile from everyone! That means our housekeepers, our maintenance gentleman, breakfast and kickback hosts, the front desk team, and, of course, the managers. We know it’s a great day when our guests are happy. Tell us about your family. I’ve been married for 14 years to Matt, who I met in college at the University of Northern Iowa. We have a daughter, Aly, who is 12 and a son, Cody, who is 9. We also have two labs, Kacee and Lily. Tell us something funny, interesting, or unique about yourself. I love to travel and am a bit of a daredevil! I've been skydiving, bungee jumping, ziplining, and even a human rollercoaster! My daughter is already begging to go skydiving, so I promised her we would go together on her 18th birthday. Read the full interview at exploremerriam.com. Howdy pardner – enjoy Wild West play here, but don’t squat with your spurs on. 4 Maps and guides and bears, oh my! maybe the Merriam sunshine squad will pick your pic and send you a sunshiney surprise! Learn more at exploremerriam.com/sunshine. Founder David Gee Campbell resided here. Peruse the monthly exhibit of talented artists in this quaint space on Merriam Drive. Shiny spheres of three. Look at your reflection, what do you see? A former space for education, this location is now a church and famous for its historic “walkout” in 1948. Grab some hot dogs and burgers – and get to know your neighbors! Want to help spruce up your neighborhood? The City of Merriam will provide up to $200 to help pay for a neighborhood block party. You can use the Neighborhood Block Party Grant to help cover party-related expenses such as food, paper goods, party favors, and to hire entertainment/performers. The City's Neighborhood Island Grant offers a 100 percent reimbursement, up to $500, to purchase preapproved plants and pay for upkeep for one of 20 islands. The City will give out one grant per common area per year. The City will take applications from April 1 through Oct. 15. Visit merriam.org/blockparty for more information about the application process or call David Easley with the Community Development Department at 913-322-5520 with any questions. All plants must be installed before June 15. You’ll be reimbursed after City staff performs a post-installation inspection and verifies ongoing maintenance through Aug. 31. Call Public Works at 913-322-5570 for an application or visit merriam.org/ neighborhoodisland for more information, including island locations and types of plants allowed at each common area. Recreation Department. Before my employment with Gardner Parks and Recreation, I worked for the Walt Disney Company. That job allowed me to feed my Disney obsession. #DisneyNerd. What’s the hardest part about planning an event? One of the struggles I deal with in my world, specifically when it comes to events, is weather. I always hope for the best but plan for the worst. What are you looking forward to most in the new community center? The new community center brings an entire host of new opportunities for our city and surrounding communities. I'm blessed to be a part of a department and city that's working to bring new programs, events, and chances for new experiences. What do you like to do when you’re not working? When I am not working, I can usually be found hanging out with family and friends, reading, going to the movies, and, in better weather, on the water at Lake of the Ozarks - bring on summer! FREE Concerts Main Stage 11 a.m. 12:30 p.m. 2 p.m.
Support local artists and makers! Discover handmade, vintage, and repurposed treasures as you explore the full festival. Vendors must register at jcprd.com or contact Devin Rumley at 913-826-3163. Favorites include BBQ, gourmet grilled cheese, Werner’s sausage, kettle corn, turkey legs, funnel cakes, shaved ice, fried pickles, and more. Join us for our community run benefiting the Merriam Parks, Recreation, and Community Center Foundation Youth Scholarship fund. Medals for finishing and placing in events. Chip timing and results. Register online at runsignup.com, in person at the Irene B. French Community Center, or call 913-322-5550. We need volunteers! Serving as a volunteer helps your community and is an opportunity to make new friends, enjoy the park, and take in all the festival activities. Plus, all volunteers get a cool shirt and lunch! Available opportunities: 5K run/walk water station and finish line, information booth (answer basic questions about the event), Home Depot wood project activities, festival cleanup, and courtesy cart drivers (min. 17 years of age). Contact Renee Nagle at 913-322-5550 or by email at rnagle@merriam.org for more information. Thank you to our sponsors! *Packet pickup at the Irene B. French Community Center. Flags 4 Freedom June 29 – July 6 // Merriam Marketplace // 5740 Merriam Drive View an astonishing patriotic display of more than 1,500 United States flags in downtown Merriam during the weeklong event. Enjoy a free concert on Thursday, July 4 at 1 p.m. Sponsor a flag to honor active military personnel, veterans, friends, and loved ones by purchasing a dedication ribbon for $15. All proceeds benefit the Merriam Parks, Recreation, and Community Center Foundation. Learn more at flags4freedom.org. We combined two awesome programs for an even greater experience! We’ll celebrate National Night Out with our Party in YOUR Park event to promote a true sense of community. National Night Out builds strong relationships between officers and Merriam residents, making our neighborhoods safer and more caring places to live and work. Adding our Party in YOUR Park event brings police and neighbors together under positive circumstances. Explore new art and playground equipment at Waterfall Park, and join us for fun, food, games, and live musical entertainment. 5740 Merriam Drive merriam.org/farmersmarket @MerriamFarmersMarket Saturdays May – September	7 a.m.–1 p.m. Named a Neighborhood Favorite on Nextdoor! Contact Dave Smothers at dsmothers@merriam.org or call 913-322-5550. Five Reasons to Support Farmers' Markets 1. Taste Real Flavors Brought directly to you, locally grown produce makes the freshest and tastiest flavors available during peak seasons. Look forward to fresh asparagus in spring, savory sweet corn in summer, and juicy apples in fall. 2. Nourish Yourself Find minimally processed foods at the farmers’ market and discover the spice of life. Unearth an amazing array of colorful produce that’s usually free of pesticides, hormones, and genetic modification. 3. Support Family Farmers Buying directly from small family farms helps support them in today’s economy. Meet local farmers and learn more about how and where your food is grown. 4. Protect the Environment Food in the U.S. travels an average of 1,500 miles to get to your plate, which creates pollution and trash with extra packaging. Food at the farmers’ market travels shorter distances and is generally grown using eco-friendly methods. 5. Connect with Your Community The farmers’ market is a community hub – a place to meet up with your friends, bring your children, and enjoy our small city in the midst of wonderful, big Kansas City. 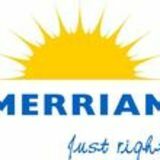 The Merriam pool pass with the free super pass upgrade (up to a $60 value!) is available to all Merriam residents. Non-resident Merriam pool pass holders during the 2018 season are also eligible to renew their pool pass through Merriam and receive the free super pass upgrade. *Limit of six members per non-resident household may be included on a season pass. If your household has more than six members, you may purchase additional single passes at a discount rate of $20 per person. Mission Family Aquatic Center 5930 W. 61st St.
Make sure to bring your pass with you! Access to participating pools won't be granted without your pool pass in hand. No exceptions. Merriam families who qualify based on income requirements may receive up to $100 in assistance annually. For more information, visit merriam.org/scholarships or call 913-322-5550. Register by May 15 for early bird fees! Be a part of Merriam’s swim or dive teams! Athletes can choose to swim only, dive only, or swim and dive for the same fee! Swim caps provided. Athletes will need a blue suit (swimoutlet.com). Information is available at merriam.org/dolphins. Parent communication is through Team Unify; information will be provided at registration. MANDATORY PARENTS MEETING: May 29 at 7 p.m. at the Irene B. French Community Center. This team is designed for young swimmers who are learning to swim/dive and working on increasing their skills and endurance. This isn't intended to be swim lessons. A qualified swimmer should be able to swim across the pool (25 yards). They don't need to know all four strokes. This team is designed for high-level swimmers who are able to swim 50 yards without stopping and know all four strokes. For information on swim team scholarship assistance, contact Anna Slocum at 913-322-5550 or aslocum@merriam.org. Intermediate 10:45–11:45 a.m. Advanced 10:45–11:45 a.m. In the event of inclement weather cancellations, notice will be given through Team Unify by 8:30 a.m. for Competitive Swim and Beginning Diving and 10 a.m. for PreCompetitive Swim and Intermediate and Advanced Diving. Information about Team Unify is provided at the parents meeting. Saturdays Warm Up 8 a.m.
Thursdays Warm Up 5:30 p.m.
Tuesdays Warm Up 5:30 p.m.
COMMUNITY CENTER The Merriam Parks and Recreation Department's mission is to provide first-class facilities and parks and enhance the quality of life for all residents and visitors through educational, recreational, and cultural opportunities. 8 a.m.– 9 p.m. 8 a.m.– 5 p.m. 8 a.m.– 4 p.m. 1– 5 p.m. Occasionally, portions of the Irene B. French Community Center may be closed for repairs, maintenance, or specially-scheduled activities and holidays. Anticipated closures will be posted as early as possible. To participate, all non-members entering the gymnasium must pay a daily admission fee. Youth or adult teams may not use open gym times to conduct practices but may rent the gym according to rental policies. Open gym times are set aside each week depending on availability. Schedules are available at merriam.org/opengym or by calling 913-322-5550. Daily fee $3 // person BOGO special May 31 – Aug. 11! The Merriam Parks and Recreation Advisory Board meets on the fourth Tuesday of each month at 6 p.m. at the Irene B. French Community Center. The Board is comprised of one representative from each of the four City wards, three at-large positions, and one youth representative. Contact Anna Slocum by email aslocum@merriam.org or call 913-322-5550 for more information. Fitness center patrons must show a photo ID card with proof of residency. If no ID is available, an ID card can be provided with proper documentation for $5. Residency information must be updated annually. Please register at least three working days prior to the start date of a class to prevent cancellation due to low enrollment. Many of our classes fill early due to popularity. A limited number of recreation scholarships are available to help defray the cost of class and membership registration fees. Limited to Merriam residents; low-income guidelines apply. For an application, contact the Merriam Parks and Recreation Department at 913-322-5550 or visit merriam.org/scholarships. The City of Merriam Parks and Recreation Department prides itself on providing first-class recreational opportunities to Merriam residents. Although patrons desire to attend all sessions for which they are registered, there may be circumstances that prevent them from completing programs. Recognizing the need to provide assistance in these situations, programs, memberships, and rental refunds will be handled in accordance with the policy posted on the website and available at the Irene B. French Community Center (IBFCC). All refunds are processed Monday through Friday, 8 a.m.– 5 p.m. For purpose of point of notification, written requests that can be verified by date will be accepted during all hours of operation at the IBFCC front desk. Refunds for transactions paid by credit card, regardless of the amount, will be credited to the account on the day the cancellation is approved. Transactions paid by cash or check will be reimbursed by check, if more than $10. Please allow up to three weeks for payment. Refunds of less than $10 will be reimbursed with cash and will require a signature from the person eligible for the refund. Administration reserves the right to review and alter policies as needed. Policy changes and notifications will be provided in writing on the website and posted at the IBFCC front desk. Individuals or groups wanting to make a contribution in honor or memory of a loved one should contact Anna Slocum by email at aslocum@merriam.org or call 913-322-5550 for more information. Turn your hobby or skill into a part-time job by teaching a class! Call 913-322-5550 or email Renee Nagle at rnagle@merriam.org to discuss your idea for a new program. Facility users are expected to respect IBFCC property and fellow users. Destruction of property, profanity, and abusive behavior won't be tolerated. Violators will be asked to leave the facility, and repeat offenders will have privileges permanently revoked. The use of tobacco products is prohibited in the IBFCC and within 10 feet of all entrances. The IBFCC isn't staffed to provide individual child supervision. Please don't drop children off and leave them unattended. Children 8 and under must be accompanied by a responsible person age 14 or older. No person under the age of 16 is allowed to participate in, or attend, adult fitness classes. Established in 1988 as a means to provide support for Merriam's recreation facilities, programs, and parks, the Merriam Community Center Foundation has provided more than $175,000 to support the Parks and Recreation Department. The Foundation’s largest fundraising activity is the annual Flags 4 Freedom event, held during the week of July 4. The Foundation also supports the arts in Merriam, annually donating a piece from the Heartland Artist Exhibition to the permanent collection hanging at the Irene B. French Community Center. Recent programs include scholarship assistance for Merriam Parks and Recreation programs and memberships; new benches at all playgrounds; and assistance in the renovation and expansion of the Tim Murphy Art Gallery. The Irene B. French Community Center's small classrooms, conference room, game room, and kitchen facilities are all available for group rentals. Our classrooms can support equipment for business meetings and events, including internet access. Staff can provide details regarding availability, rental fees, and reservation deposits. Call 913-322-5550 or visit merriam.org/parks for more information. *Capacity varies depending on selected room arrangement. Chatlain Park 6300 Carter Ave.
Tucked in the South Park neighborhood, this shelter provides eight picnic tables and a large grill­– perfect for all events. Amenities include a playground and swings, walking trail, new basketball court, new pickleball court, and open green space. This 5.25-acre park provides access to the Turkey Creek Streamway Trail. The pavilion has eight picnic tables and a large grill. Amenities include a playground and swings, open green space, and paved parking. This facility is perfect for corporate picnics, family reunions, and other gatherings. Amenities include a bridge to the Turkey Creek Streamway Trail, electrical hookups, playground equipment, and a sand volleyball court across the street at the community center. Tables and chairs aren't provided. This park houses Julius McFarlin Fields. There are four soccer fields available for team practices. Fields are reserved by the hour. Call 913-322-5550 for shelter and field rentals. ART GALLERY Upcoming Exhibits In its 23rd year, the Tim Murphy Art Gallery strives to support quality art experiences in the City and strengthen the community culturally and educationally. All exhibits are free to the public with an opening night reception the first Thursday of each month from 7–8:30 p.m. Come meet the artists and enjoy complimentary refreshments. Exhibits can be viewed online at merriam.org/artgallery. Northland Art League *Opening reception changed due to Independence Day. 2020 Call for Artists // Application deadline: July 8 The Art Gallery is accepting applications for the 2020 monthly exhibits. Interested artists may submit five digitals of their work. All exhibited paintings and photographs must be matted and framed unless wrap-around-canvas technique is utilized. Considered media includes: photography, watercolor, pastel, oil or acrylic, ceramics, sculpture, fiber arts, and glass. For more information, contact Dave Smothers at 913-322-5550 or dsmothers@merriam.org. Find applications online at merriam.org/artgallery. *Proof of residency required **Senior Household (60+) $225 Who qualifies for resident fees? •	Any person owning taxable real estate in Merriam. •	Any person permanently residing in Merriam. What can be used as proof of residency? •	A valid Kansas driver’s license or state ID with current address. Strength •	Life/Hammer Strength selectorized equipment •	Dual adjustable pulley machine •	Smith machine •	Adjustable bench •	Dumbbell rack •	Free-weight dumbbells •	Kettlebells •	Stability balls Cardiovascular •	LifeFitness treadmills (4) •	StepMill •	LifeFitness recumbent bicycle •	LifeFitness upright bicycle •	LifeFitness ellipitical (2) •	SciFit total body recumbent stepper •	LifeFitness row trainer Equipment includes a 900mHz receiver to select from your choice of three televisions. ...................................................... Personalized Fitness Assessment & Equipment Orientation A certified fitness specialist is available by appointment to: •	Establish appropriate weight and seat settings for all LifeFitness machines. •	Familiarize users with cardiovascular equipment. •	Assess functional range of motion and basic mobility. •	Recommend a personalized starting workout based on activity levels and fitness goals. Open Gym Regularly-scheduled open gym times are set aside each week depending on availability. Schedules are available at merriam.org/opengym or by calling 913-322-5550. To participate, all non-members entering the gymnasium must pay a $3 daily admission fee. Buy one, get one admission free from May 31–Aug. 11. Youth or adult teams may not use open gym times to conduct practices but may rent the gym according to rental policies. Fitness Center Membership Scholarship Program Merriam residents who qualify based on income requirements may receive assistance toward membership. Each applicant/family is eligible for $100 of assistance annually through the Merriam Parks, Recreation, and Community Center Foundation. More information, including an application, is available at the Irene B. French Community Center, by calling 913-322-5550, or visiting merriam.org/scholarships. Assistance is based on available funds. Be a Regular Fitness Center User and Win a FREE Membership! Every quarter, one lucky member will have the opportunity to win a FREE individual quarterly membership! To qualify, you must be a fitness center member for at least two consecutive quarters. ...................................................... Call 913-322-5550 to schedule an appointment. Renew your membership online at merriam.org/parks. Parks & Rec // Youth REGISTRATION ....................................................................................................................................................................... Registration begins CALL ONLINE VISIT 913-322-5550 merriam.org/park Irene B. French Community Center April 1 ....................................................................................................................................................................... All programs are located at the Irene B. French Community Center unless otherwise noted. Host your child’s birthday party here! Our game room is available for use on a drop-in basis. The game room includes lounge furniture, a pool table, pingpong table, foosball table, Wii® gaming station with Wii® Sports, and a 52” high-definition television. Children age 8 and under must be accompanied by a person age 14 or older. Daily Fee: $2 // person. Use of game room equipment is included. Preschool Indoor Playground (PIP) Tuesdays // 9:30–11:30 a.m.
Pretend you’re a truck driver, policeman, motorcycle driver, and more. At PIP there are Little Tyke® ride-along toys, a kitchen, and interactive stations like a work bench and pretend lawn care tools. Have fun, make new friends, run, and be loud. Parents must supervise their own children during playground time. $2 // child Punch cards available: $10 for 10 visits. Turn your hobby or skill into a part-time job by teaching a class. Contact Renee Nagle at rnagle@merriam.org to share your idea! Includes the preschool playground setup in the gym with tables and chairs for 20. $116 // MERRIAM RESIDENT $145 // NON-RESIDENT Intended for children ages 5 and under. Includes the preschool playground setup in the gym plus the use of a multi-purpose room with maximum seating of 75. $144 // MERRIAM RESIDENT $180 // NON-RESIDENT Intended for children ages 5 and under. Includes use of all activities and equipment in game room and a separate party room with seating for 24. Game room includes a pool table, pingpong table, foosball table, Wii® gaming system, and a 52” high-definition television. $65 // MERRIAM RESIDENT $85 // NON-RESIDENT Intended for children ages 8 and up. Includes the gymnasium and a separate party room with seating for 24 people. Equipment available for basketball, volleyball, and pickleball. $60 // MERRIAM RESIDENT $70 // NON-RESIDENT Intended for children ages 5 and up. Parks & Rec // Adult Classes All programs are located at the Irene B. French Community Center. Join us for a fun, 60-minute cardio dance class that combines a variety of dance moves with interval and resistance training for a full-body workout! YOGA ........................................................ Yoga mats and props are provided. Pickleball is so popular because any age, gender, and athletic ability can play. The game is a combination of pingpong, tennis, and badminton. Equipment available. Parks & Rec // 50+ Programs & Classes All programs are located at the Irene B. French Community Center. Congregate Meals Monday–Friday Participate in the Johnson County Nutrition Program. This meal program is offered at 11:30 a.m. each weekday. Home delivered meals are available for anyone who's unable to come to the community center. Please call 913-677-2048 for more information about the program or to make a reservation. Small donation requested. This club is held on the first and third Friday of each month from 10:30 a.m. to noon. Join your friends and neighbors for food, fun, and a weekly program. New members are always welcome! For more information, contact Teddi Oppenheimer at 913-722-3343. Bimonthly Newsletter The Merriam Parks and Recreation Department sends out a bimonthly newsletter with listings of special events, programs, and classes dedicated to the 50 and better age group. To be placed on this mailing list, call 913-322-5550. Second Thursdays: April 11, May 9, June 13*, July 11, Aug. 8 1:30–3:30 p.m. // $3 Let’s all shout “BINGO!” Join the community on the second Thursday of each month for a fun-filled afternoon! Snacks and beverages are provided. Prizes include gift cards and consumables. Silver Screen Matinée Wednesdays // 1 p.m. // Free We're going to make you an offer you can’t refuse. A FREE showing of a recent movie in a relaxed environment. Schedules are available at the front desk and highlighted in the bimonthly “Boomer Buzz” newsletter. Bring a friend and snack. Free popcorn is provided the second and fourth Wednesday of each month. Movies subject to change. Keep moving with this low-impact physical activity program proven to reduce pain and decrease stiffness. This recreational, chair-based exercise class includes range of motion exercises that are suitable for every fitness level and ability. $3 donation suggested. Registration isn't required. This is a gentler form of practicing yoga postures while sitting or standing, using a chair for support. It's beneficial for anyone as it increases flexibility, improves strength, and reduces tension. In addition to yoga poses, breathing techniques are also part of the practice. All classes end with a short period of deep relaxation. It’s just as fun as tennis, pingpong, or badminton and uses the same skill set. This fun and easy to learn game has swept the nation in popularity. All levels welcome. Equipment available. “Bowlers always have time to spare,” so join us and try your hand at Wii® bowling. No special shoes or ball required – just a game controller and big screen TV. Whether you’re a semi-pro or a newbie, you’re sure to have fun. If bowling is “right up your alley,” this game is for you. 10–10:45 a.m. 11–11:45 a.m. 11–11:45 a.m. 11–11:45 a.m. 11–11:45 a.m. 8:15–11:15 a.m. 4–6:30 p.m. 10–11:30 a.m. 10–11:30 a.m.
Trails are a popular and inexpensive way for everyone in the family to enjoy some level of physical activity and focus on health and wellness. Regardless of what activity you are participating in – walking, jogging, biking, or skating – everyone should follow the same set of guidelines. Below is a list provided by the International Bicycle Fund. ▶▶Be Courteous – respect other users regardless of their mode, speed, or skill level. ▶▶Be Predictable – travel in a consistent manner and always look behind before changing positions on the trail. ▶▶Don’t Block the Trail – use only half the trail if in a group or with pets. ▶▶Dogs Must Remain on Leash – please clean up after your pet; waste stations are located along the trail for your convenience. ▶▶Obey All Traffic Signs and Signals – use extra caution where the trail crosses the street and use cross signals when available. ▶▶Give Audible Warning BEFORE Passing – use voice, bell, or horn and allow person you're passing time to respond. ▶▶Keep Right – except when passing. ▶▶Stopping – move off the trail and beware of others approaching from behind. ▶▶Pass on the Left – yield to slower and oncoming traffic, pass with ample separation, and move back to the right when at a safe distance. Remember kids and pets can be unpredictable. Waterfall Park Merriam Marketplace Campbell Park Chatlain Park 75th St. Trail mileage markers are available every 1/2 mile. Emergency (E911) trail markers are available every 1/10 mile. For more information about the events listed above, please call City Hall at 913-322-5500 or visit merriam.org.